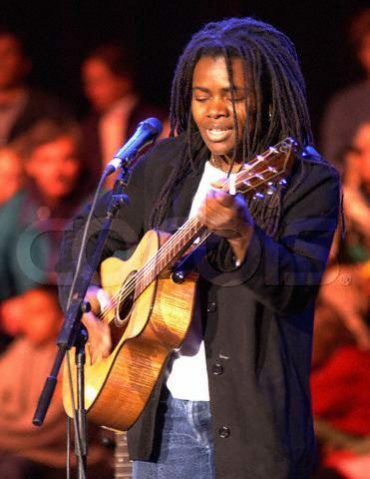 The Bridge Benefit Concert XV on October 21 & 21, 2001 saw Tracy Chapman’s 4th appearance at the Bridge, after having been part of the artist in 1988, 1989 and 1991. 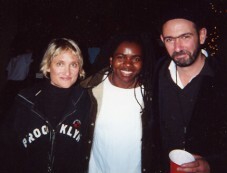 That year Crazy Horse, R.E.M., Pearl Jam, Billy Idol, Dave Matthews, Ben Harper, and Jill Sobule were also on the bill. THE ONE DAY A YEAR when rock stars come to Mountain View’s Shoreline Amphitheatre, casting aside egos for charity, Pearl Jam’s Eddie Vedder sprung the warmest moment of them all at Saturday’s Bridge School Benefit. After an emotional duet on “Indifference” with Ben Harper (who played a powerful solo set earlier in the day), Vedder introduced his favorite Bridge School student from years past, sitting on stage with dozens of other students. Vedder acted a bit jealous after noticing the girl’s enthusiasm during Billy Idol’s earlier set. “Now Billy Idol is her favorite,” he said, mock-pouting. Then Vedder brightened and proudly announced that the girl got into UC Berkeley since he last saw her. He dedicated her favorite song “Last Kiss” to her, and watched as his band false started and flubbed the beginning. “She’s a sophomore at UC Berkeley and we can’t even play ‘Last Kiss,’ ” he moaned. 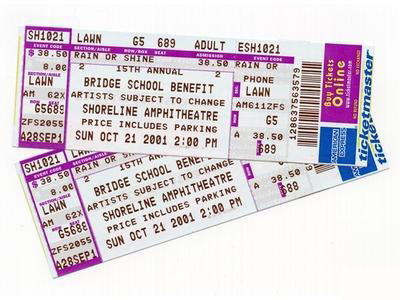 Pearl Jam is more of a regular at Bridge School shows than anyone not named Young. Playing their fifth year — and first performance in more than a year, Vedder said — the band shone brightest among the usual star-studded line-up. Neil Young and wife Pegi started the benefit in 1986 to help the school for disabled children, attended by his two sons. The show has become one of the most successful and longest-running benefits ever. 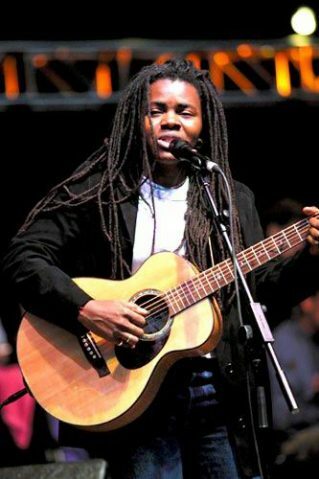 Saturday’s show featured outstanding solo sets from Harper and Tracy Chapman, fist-pumping rock from Billy Idol, fan-charged performances from Dave Matthews and R.E.M., winking enthusiasm from Jill Sobule, and an inspired grand finale from Neil Young and Crazy Horse. Shadows from current world affairs hung over the show throughout. Young played “All You Need is Love,” “Blowin’ In the Wind,” and show closer “Imagine” that turned into a huge crowd sing-along, complete with video lyrics. Idol played the old Buffalo Springfield anti-war anthem “For What’s It’s Worth” (which surprisingly did not feature a cameo by Young, the former Buffalo Springfield guitarist). Toned down, Harper can sound like Cat Stevens (as he did during a soulful cover of “Sexual Healing”), or rip it up to Lenny Kravitz and beyond. His last note on “The Woman in You” peaked at about 30 continuous seconds, leaving Harper red-faced and the crowd screaming. Billy Idol would be one of the last people someone might expect to shine at an acoustic event. Guitarist and catalyst Steve Stevens is so reliant on special effects and noise-making that comes with electricity, it was debatable whether he even owned an acoustic. He does. The format just gave Stevens a chance to show off his picking and some frantic double-time strumming. Songs dependent on power chords, like “Eyes Without a Face,” and “White Wedding,” came off just as powerfully, if not a bit altered and fresh. Idol of course, was Idol, jumping around in leather, thrusting fists at the crowd, and charming the kids on stage with his adolescent behavior. The set was a quick run through Idol’s greatest hits, including “Rock the Cradle,” Got To Be a Lover,” “Sweet 16,” “Rebel Yell,” and “Mony Mony” (with the usual chant encouraging the crowd to get, er, jiggy. It was hard to tell if the kids were singing along to that part). Chapman was a big shift from the hyperactive Idol. 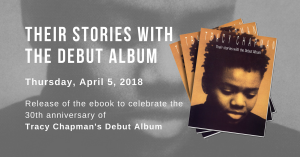 The crowd quieted down, as if to hear every syllable coming out of her mouth as she opened solo with “If Not Now,” from her 1988 self-titled debut. They couldn’t help themselves two songs later, during “Fast Car,” — one of the most gorgeous and compelling songs written during the ’80s. She slowed it down just a tad, delivering every word with a precision not lost on the audience, who sang all the way through. Chapman gave everyone plenty of space to keep singing along, making the most of a format practically made for her. She ended her set with a Delta Blues version of “Give Me One Reason,” bare bones and slower, again conforming just a bit for the format. R.E.M. played a straightforward set; the lack of electricity barely changed anything. Singer Michael Stipe sounded good on set-standards “Man on the Moon,” a sedate “The One I Love,” and “Losing My Religion.” R.E.M. displayed a comfortable sound, not fantastic, not embarrassing — mirroring some of their recent records. Things perked up for Pearl Jam, who ran through “Long Road,” “Of the Girl,” “Daughter,” “Better Man” and “Drifting” during an outstanding 11-song set. The band is getting more organic as it ages; there was barely anything on Saturday recalling its importance to the grunge scene a decade ago. If anything, unveiling new songs makes Pearl Jam sound more like Young and other fluid songwriters like Bruce Springsteen. The band is comfortable enough to just show up and play and Young’s request — and excel. The members manage song dynamics masterfully and builds the set to get better as it progresses. They then shelved the typical ending all-star jam for a sedate version of “Imagine,” with Young playing John Lennon’s vocal part on his guitar and allowing the other artists and crowd to sing along. It wasn’t the typical raucous ending, but seemed right for the time and mood. Neil Young’s annual Bridge School Benefit has always boasted surprises. Still, it’s a safe bet that not even Nostradamus could have predicted the all- star performance that closed Saturday’s concert at Shoreline Amphitheatre. 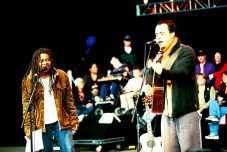 At night’s end, the performers — R.E.M., Pearl Jam, Dave Matthews, Billy Idol, Ben Harper, Tracy Chapman and Jill Sobule — gathered onstage for the traditional group jam. But this was an extraordinary finale for an extraordinary time: Instead of playing, the musicians silently held hands and embraced while the sold-out crowd serenaded them with John Lennon’s paean to pacifism, “Imagine.” Young, wearing a New York Fire Department baseball cap, provided guitar accompaniment as lyrics were projected onto an overhead screen. When the audience reached the final refrain, R.E.M. singer Michael Stipe flashed the peace sign. Me Some Truth.” R.E.M. closed with “Losing My Religion,” a song whose title carries new resonance in an era lousy with holy warriors and crusaders. 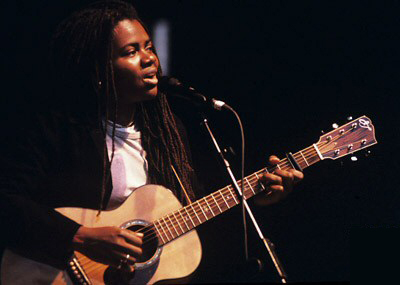 By injecting some consciousness-raising into their set lists, the Bridge artists reiterated music’s role as a medium of communication. Music can also be fun and enthralling on a gut level, and Saturday’s show offered plenty to satisfy audience members — including Harper’s girlfriend Laura Dern, Sean and Robin Wright Penn and comedian Will Durst — seeking either of those listening experiences. R.E.M. played a tremendous set marked by sweeping arrangements and Stipe’s playful stage presence. The band shifted between new material (a lush, dramatic “Imitation of Life,” a hushed, emotional “I’ve Been High”) and older favorites (“Cuyahoga,” a bass-heavy “Let Me In” and a hip-swinging “Lotus”). Wise words from a maverick who endures as a musical icon precisely because he’s an iconoclast, one who isn’t afraid to speak his mind or fight for his right to keep on rocking in a free-speech world.